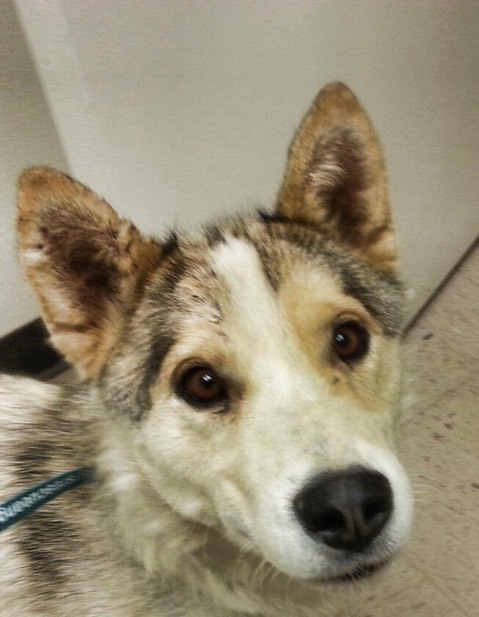 Sweet little Nanook came to our attention on November 17th 2016, we were contacted by the staff at East Valley Shelter asking for our help. 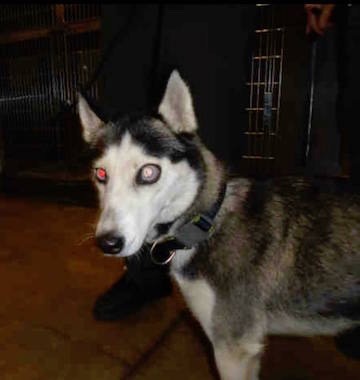 We were informed that she had been surrendered to the shelter and was blind. 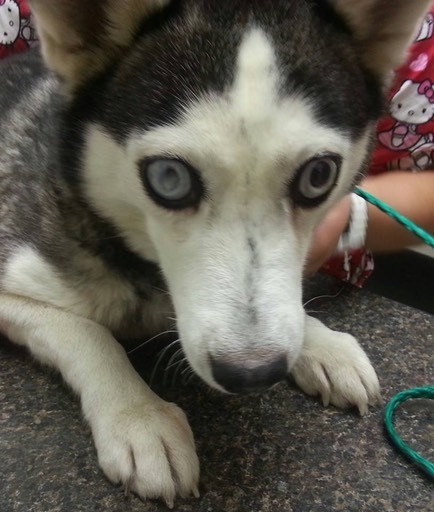 Untreated glaucoma had left her with bulbous and painful eyeballs and she was blind and in pain. 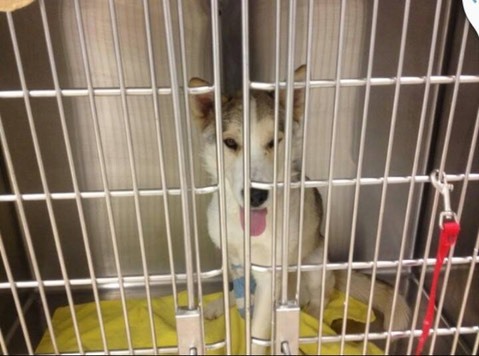 Shelter staff knew that little Nanook needed immediate treatment and a knowledgable and caring place to recover. We, of course, said we would take her. When the pressure builds up in the eyes so much that it causes them to bulge there is no other option but to remove the eyes and therefore remove the pressure. 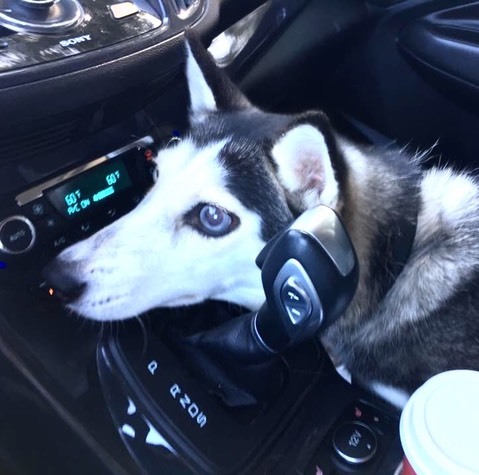 We agreed to bring Nanook into rescue and arranged for her to go straight to our vet so a treatment plan could begin immediately. 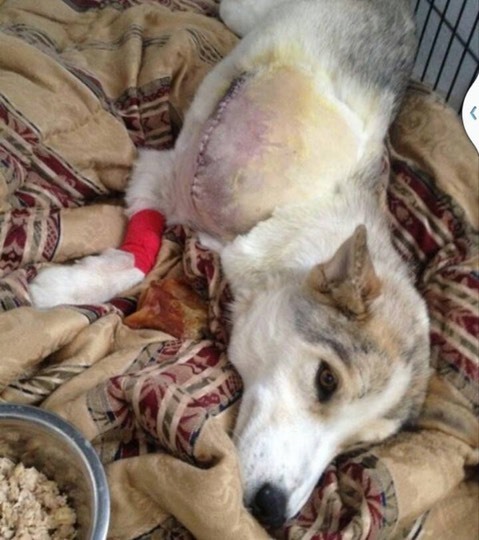 Surgery date set for November 22nd and she will recuperate in a loving foster home. 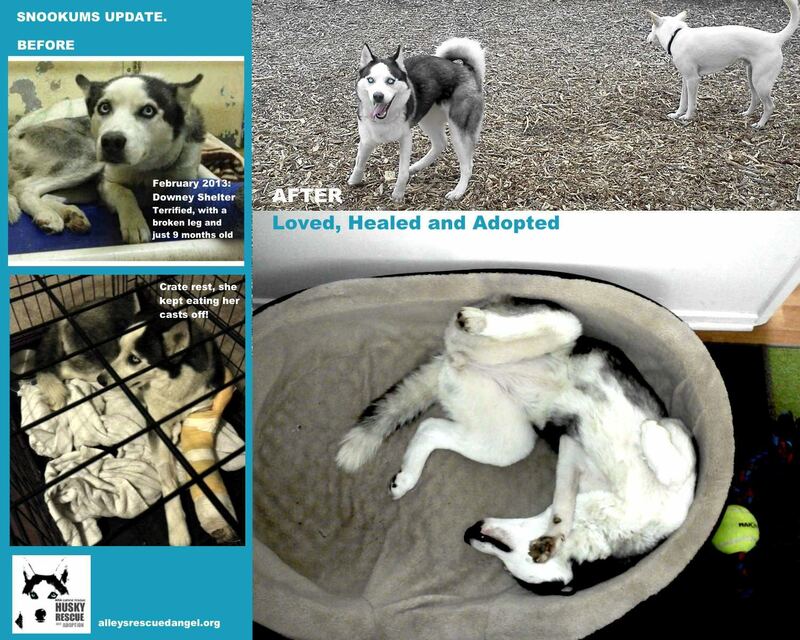 One of the first things that we do when we rescue a husky from the shelter is to change their name. We believe that by changing their name it signals a new beginning and a new start at a better life. 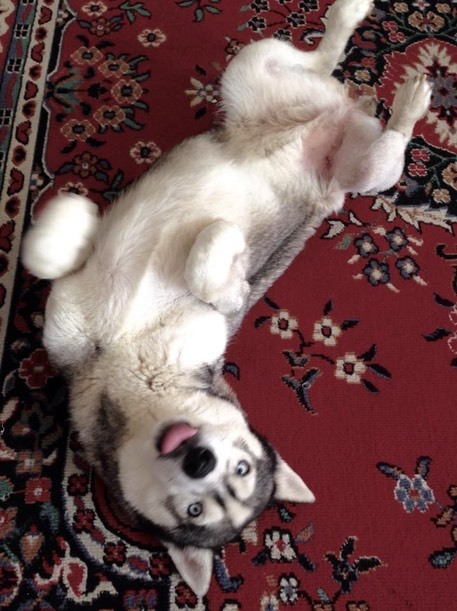 Nanook is now called Mo and is safe with us. We will update when she is out of surgery. 1st December 2016: Mo’s Surgery went well and she is recuperating in foster care until she is medically cleared for adoption. She is very affectionate and just wants to cuddle. 22nd December 2016: Mo is now ready for adoption. January 28th 2017. Mo found the perfect family and was adopted. Sh is now living the dream in Washington. We love you MO. 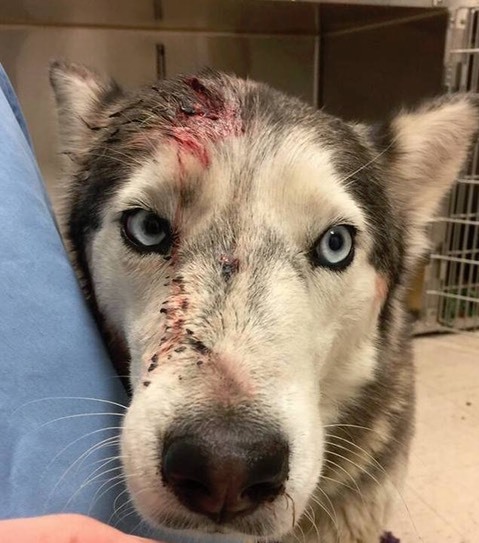 We just received a call about this girl who appears to have been attacked by a person with a sharp object, not an animal. 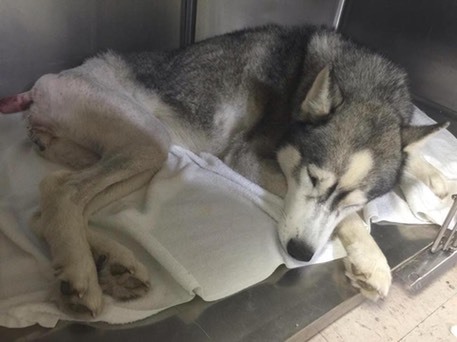 Surrendered at a Vet Office with a cracked skull, her tail in slices and in need of medical attention. We have agreed to step up but do need a little assistance with her bill. Please consider donating to this baby who needs our help. On November 8th, 2016 we checked her into the vet hospital to have her tail amputated her head injury treated. The surgeries went well and she was even able to give the vet tech a kiss as she came out of anesthesia. 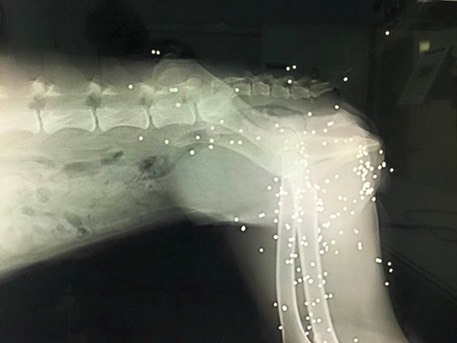 The xrays for our new Riverside girl, now known as Stella, showed a shocking amount of shrapnel in her rear end. 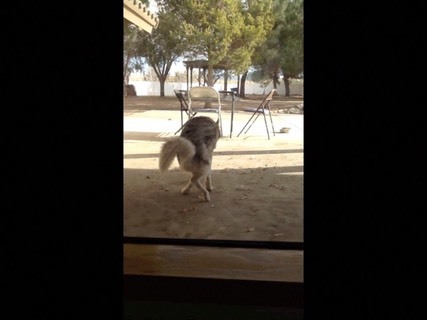 Her tail was so infected that she was trying to chew it off. How could anyone be so cruel to repeatedly shoot her like this! 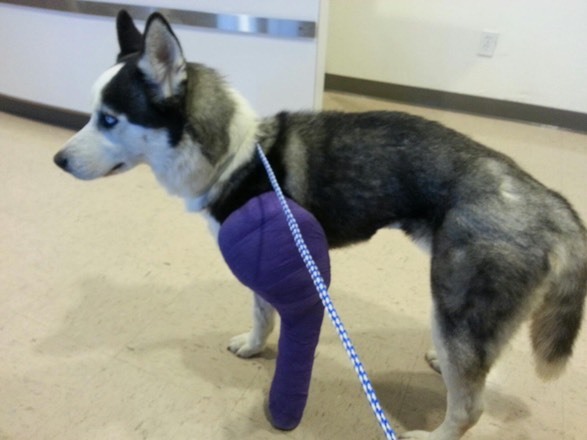 Our surgeon had to remove the damaged portion of her tail and the bb's that where a serious concern to the surgeon. They are not able to remove all but believe she should live a full happy life once we get the serious problems fixed. 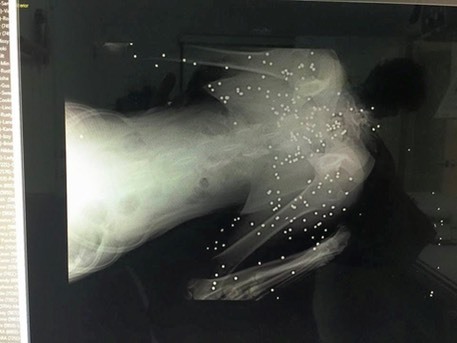 We are continuing to monitor for lead toxicity and any other complications that could result from the trauma. *Update Dec 2016. 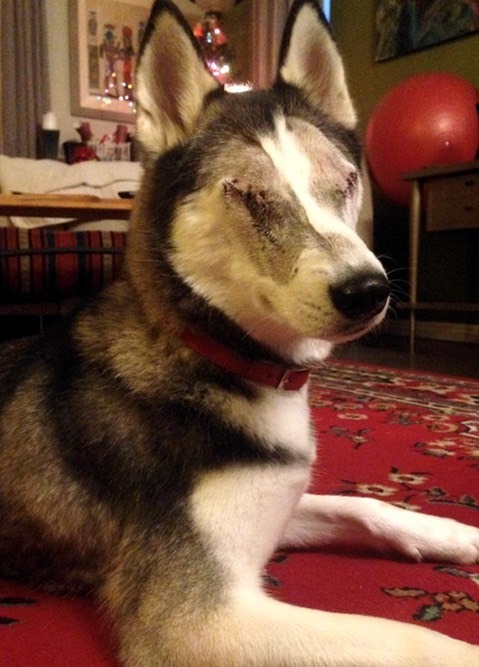 Stella is living a full and happy life and is showing no signs of physical discomfort from the shrapnel. She is the official greeter at the dog park and is incredibly affectionate to everyone. 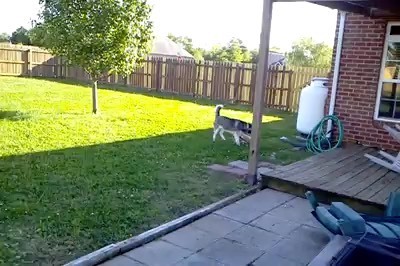 She is a remarkable little husky. 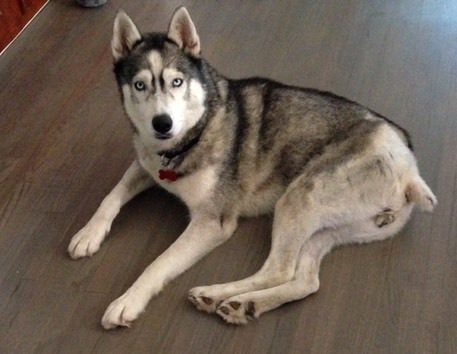 Stella is now recuperating in foster care while we restore her spirit and health. 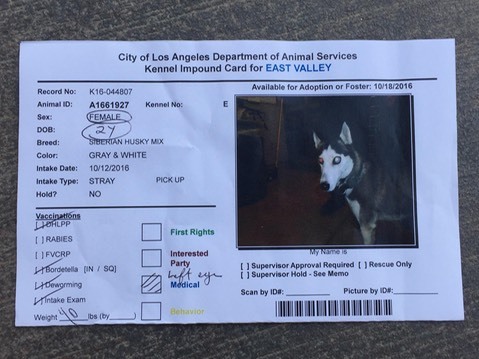 We received an urgent call from Animal Control on 14 March 2014 about a 6 month old husky pup that had been confiscated from her owners. 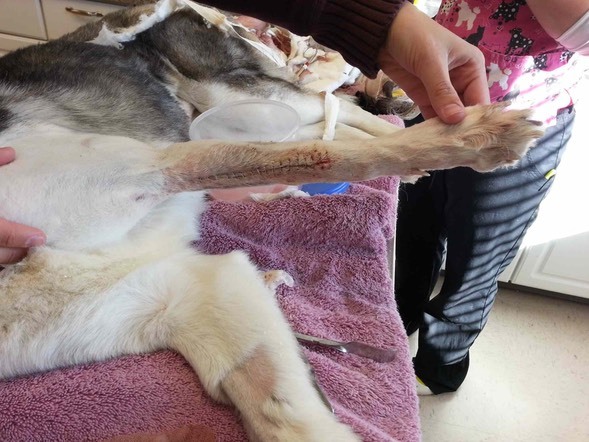 The pup had had half of her front leg hacked off, and she had an infection in the bone. We immediately agreed to take her and met Animal Control at our vet to begin pain medication and antibiotics. 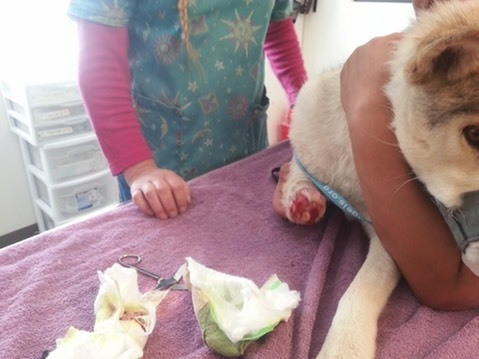 We never know the outcome of these animal cruelty prosecutions, the particulars of the case are withheld from us, all we can hope is that the savage person responsible for this horrendous act was severely punished. Considering the trauma that Sweetie has endured at the hands of humans, it truly is amazing that she is so trusting and loving as we check her into the vet for her surgery. 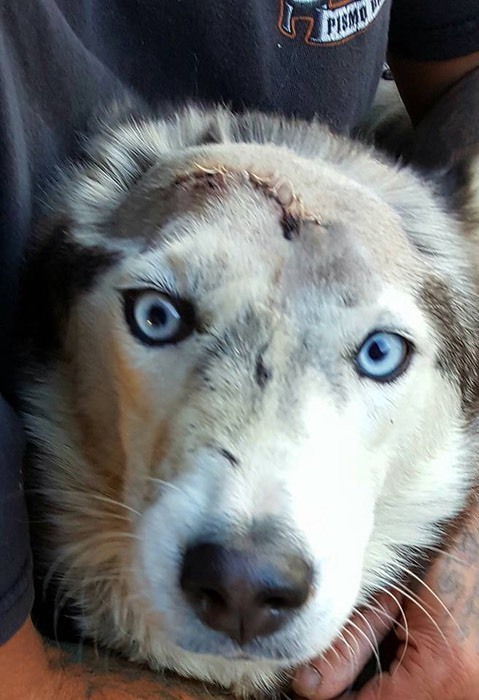 We contacted the surgeon that operated on Flippy, as he specializes in this type of surgery and this little girl deserves the very best from this point on. 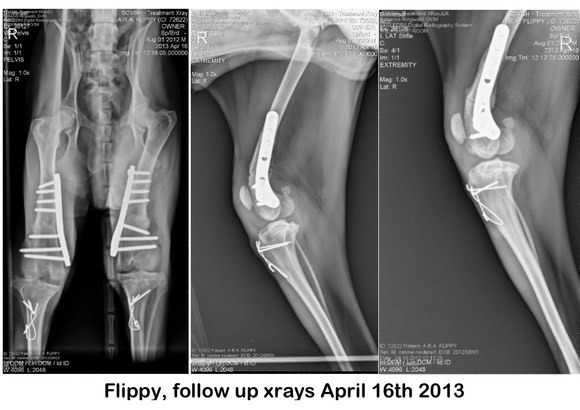 Surgery is scheduled for 19 March 2014. The surgery went well,and here she is comfortably recuperating at the ranch one day after her amputaion. Her spirit is strong and she tries to kiss our hands as we reach in to pet her or feed her…she is adorable, and so little. 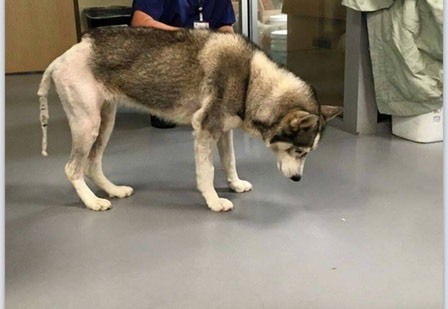 We have a foster home lined up for her so that she can heal without all the other huskies bumping into her and playing with her. 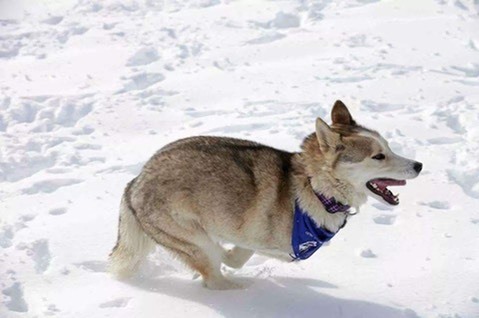 As soon as she is medically cleared by her surgeon we will start searching for the most perfect forever home for her. 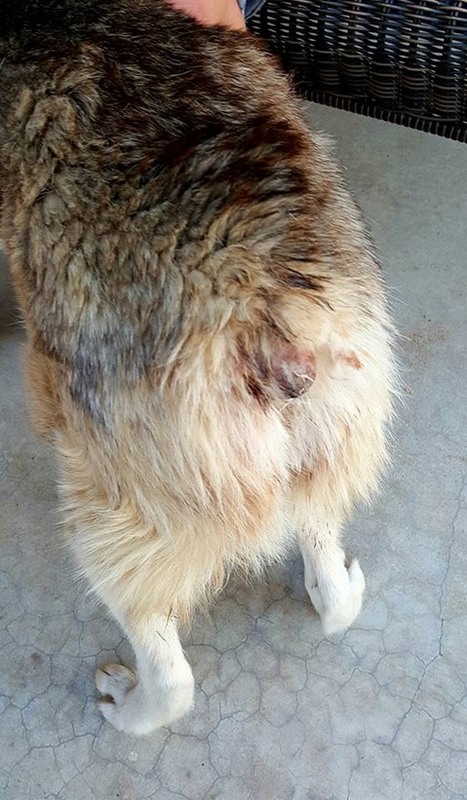 Little Flippy (AKA Baby Knees) is another heartbreaking victim of backyard breeders who didn’t care about the health of the pups they were breeding, just about how much money they could sell them for! This little guy was a “For Sale On Craigslist”, he was bought by a couple that could not afford to care for his needs and the degeneration in his back legs and knees got worse and worse. He was owner-surrendered to us on February 7th, we have had him examined by two different specialist so we can create a surgical plan for him. The little guy was only 6 months old and he needed corrective osteo block trochleoplasty, lateral capsular release with medial capsular imbrications to each femur and medial tibial tuberosity transposition to each proximal tibia. 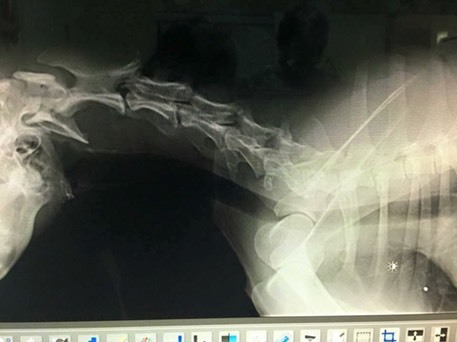 This is the complex way of saying that his back legs need total re-alignment but a full recovery is expected after all this surgical repair. His surgery was scheduled for March 12th 2013. We saved Snookums from Downey animal shelter in February 2013, she had been hit by a car, suffered a broken leg and then left to die at the shelter when her owners dumped her there. 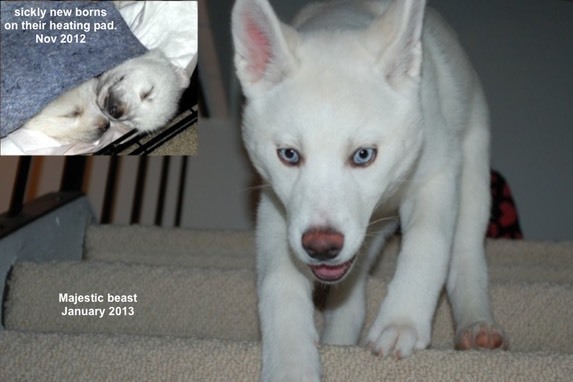 She was only 7 months old. 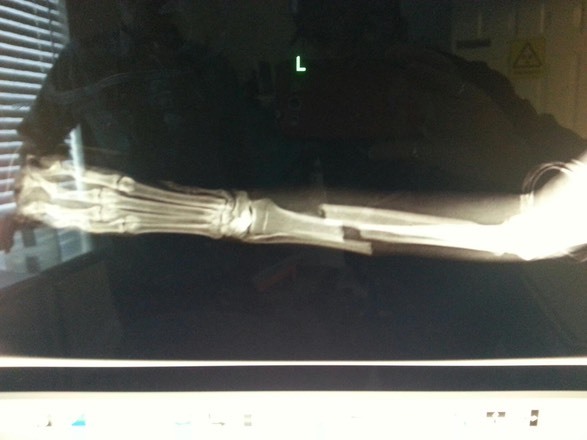 She had a cracked radius and ulna, a bad break that needed plating and our ortho surgeons gave a rough estimate $2500.00 to $3200.00. With the help of our amazing supporters we got this little girl straight into surgery. 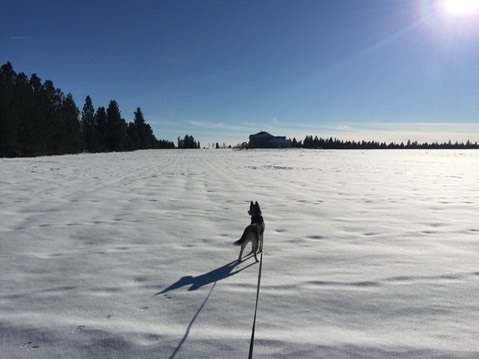 It was hard work keeping the casts on this rambunctious little puppy, she shredded quite a few of them! She is now ADOPTED, healed and LOVED in her furever home. 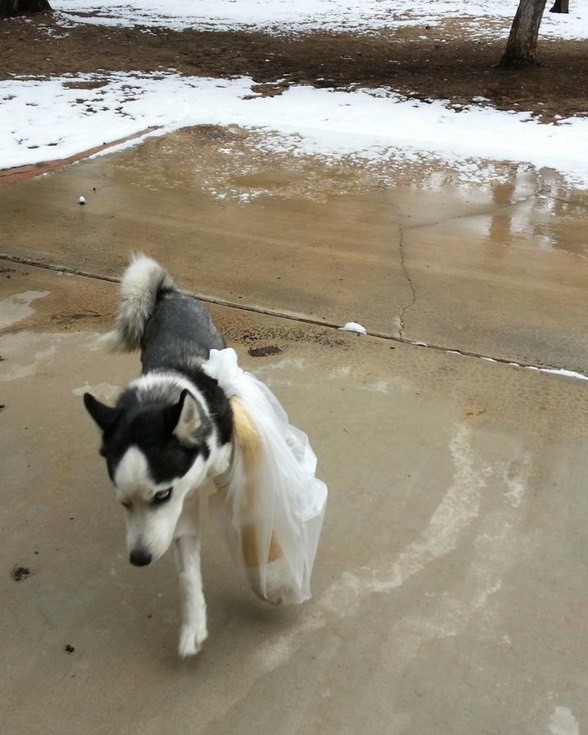 Trying to keep Snookums' casts dry so she can play in the snow. Ayla is one of Cinnamon's pups (who came into rescue pregnant). It was hard work keeping these little pups alive, they were born with respiratory infections and struggled every day. Look at her now, a picture of strength and health. We rescued Rose from San Bernardino Shelter CA on January 12th, 2013. She had been overlooked by everyone else because she had severe trauma to her left eye resulting in a bulging eyeball. 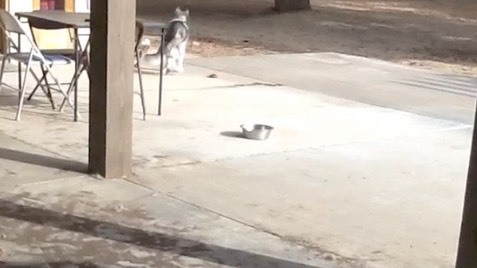 (link to her shelter video). 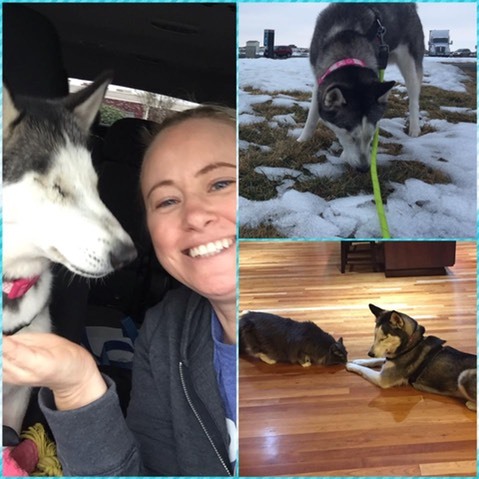 She needed surgery immediately, our vet informed us that even though rose was behaving like a brave little husky the pain that she must be in with the build up of eye pressure must be excruciating. We quickly did a fundraiser to cover the anticipated $700 vet fees and scheduled the surgery for January 15th. After surgery the vet informed us that Rose's eye was so badly damaged that it literally 'exploded' when they removed it and that they could not imagine the amount of pain that she had been in. 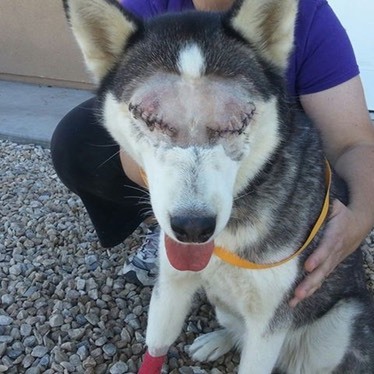 We are pleased to say that the surgery was a complete success, she has vision in her remaining eye, she has been adopted and has healed beautifully under the watchful and loving eyes of her new parents. 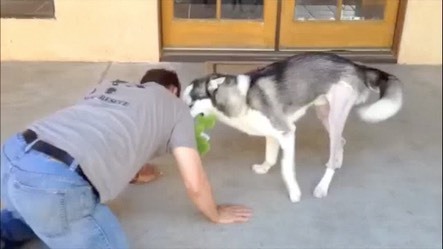 The video shows the incredible journey of healing for our little Baby K Flipper. To recap his story he was bought via an ad in "PennySaver”, by a young couple that did not know how genetically broken he was and did not know about adopting from shelters! 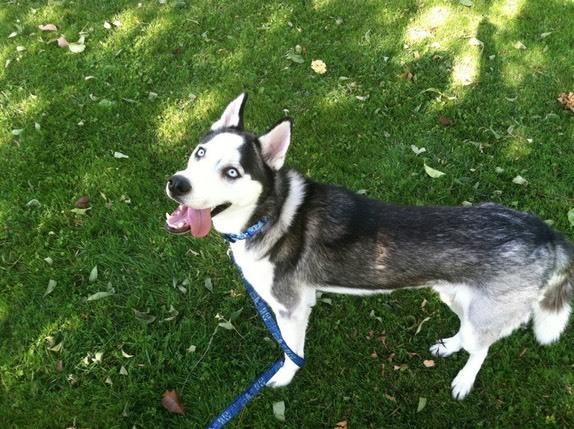 He was then owner-surrendered to us on February 7th 2013 because his owners couldn't afford the medical care he needed. We had him examined by two different specialists and a surgical plan was created for him. He received corrective osteo block trochleoplasty, lateral capsular release with medial capsular imbrications to each femur and medial tibial tuberosity transposition to each proximal tibia. We must thank our surgeons, who gave us an incredible $15,000 discount, and the hundred or more donors that contributed to his medical costs. Without you all, we would not have been able to save this pup.